So let's consider a (k)new view, that perhaps the heart of the earth is YOU. - we are connected as ONE. It's simply a matter of changing views, as Gratitude reveals (k)new worlds within YOU. offering a steady view of timely Life. changes, rather than just the view. So how to re-view life as a child, trusting, open and pure? Now Open your eyes prepared to (k)newly view life through the eyes of Gratitude. 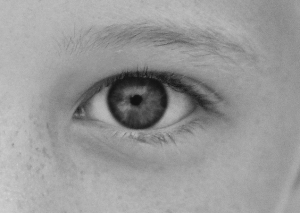 While our eyes remain the same size, the muscles used to alter our view are continually in a state of change, actively assisting our shifting gaze. Here is a fabulous exercise to strengthen eye muscles, overcoming possible atrophy caused by staring at fixed distances - such as computer screens and other things. Consider using one or more exercises a day to maintain healthy eye muscles. 1) stare at the tip of your nose. next, move your gaze to 15 feet in front f you. Now, extend your view to infinity ~ as far as you can see. Now move back and forth, through each stage 12 x's. 2) Look up at the 12 o'clock position. Now look at three o'clock, six, nine and back to twelve. hold each station for about three seconds, moving round the clock three times. Now reverse the flow, going back in time ... three spins round you go! 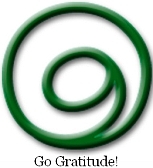 3) Make the symbol of Gratitude, beginning within moving out and around to complete the form. Now reverse this spin, moving within to center you view in Gratitude ... repeat 'til you feel complete. to travel, dance, and explore the (k)new. soles to the center of the Earth. sole-fully connecting all who stand as Gratitude. ~ this, too, is the gift of Gratitude. What great feats have your feet greeted, too? Stand in living nature, between the earth and the sky. 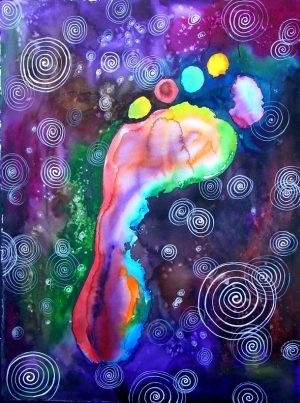 Feel the earth under your feet; feel how the earth carries you and holds you up. In every way possible, spend today giving thanks to you ... Remember, as you do, you are setting a pattern for others to follow, too. Imagine yourself as a newborn, an infant, a child, teen, young adult ~ and so on ~ until you connect all with Now. At each stage, give thanks for your unique-ness, talents, and timely experiences. Allow all aspects of you to come together, as One in Love and Gratitude. For the past 12 days our primary focus has been on Self, creating a greater connection to what IS, allowing our Love to BE and granting Gratitude the power to lead in a universal, yet personal way. 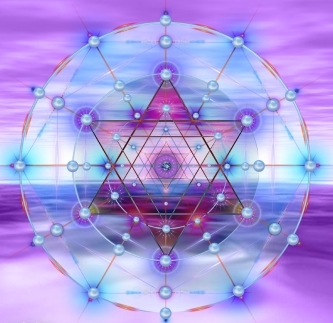 As we develop a strong sense of Self Gratitude, this Source Force energy will, by nature of Syntropy, call order to chaos, re-creating our present-day civilizations into a harmonious gathering of Love as Light. What is Syntropy? This word, coined by Luigi Fantappié in 1942, is defined as such: "A tendency towards order and symmetrical combinations, designs of ever more advantageous and orderly patterns. Evolutionary cooperation." 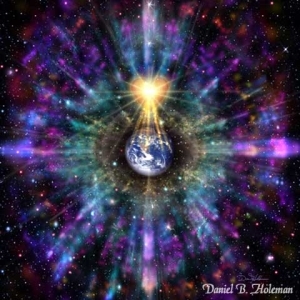 This is exactly what we are witnessing Now - our collective consciousness waking to our innate co-creative abilities - in a magnificent mandalic precession of manifested miracles. Wow! From an energetic standpoint, just imagine what our growing field of Gratitude looks like, as each one of us stands as a point of Light, a being of Love, as waking Gratitude? 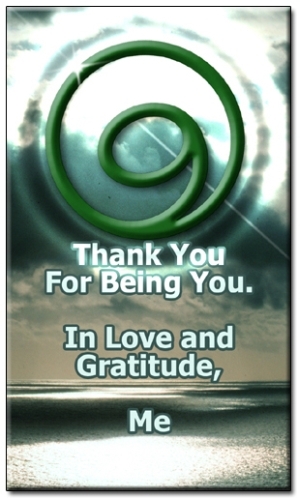 Consider this - You are the "see'd" at the heart of Gratitude, the community is the spiral expanding, exploring and expressing Love as Life. 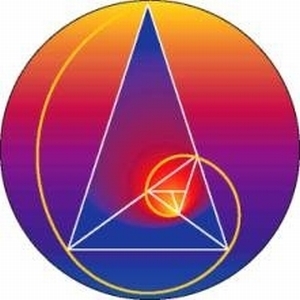 As each of us moves through this geometric spin, it creates fractals, waves of creation - a (k)new world evolving through syntropy in order to Divinely BE. What a sight to see! "We are no longer small, emotionally reactive human beings with problems and issues to solve. Instead we are becoming creational source beings who share a dance with Life, who seek the very best in ourselves and others, who invent a new reality by loving it passionately and powerfully into being." As we spiral out, beyond the Self, to co-create with others, what virtue enhances this syntropic journey, allowing us to manifest increasingly complex, harmonious structures that support our dreams and passionate pursuits? ... While gracefully moving through daily challenges, as we change and re-arrange our reality? In essence: What keeps YOU true to YOU, while co-creating through Gratitude? You see, Fortitude, defined as "constancy under difficulty", is Gratitude in action. This is what keeps us true to our selves, following Divine inner virtues, while serving both Self and our growing family of Gratitude. Why is fortitude such a powerful gift? 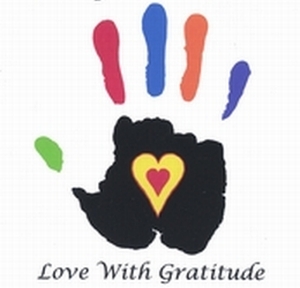 strength, commitment, and dedication to co-creating a world waking to the power of Love in Gratitude. Perhaps! ... Certainly a (k)new confirmation our timing is Divine, our efforts sublime and all is well, all IS well. "God, Goddess, Divine Spirit of all there is, we thank you for this opportunity to gather together in one another's company. We thank you for the light you bring to this family gathering. Please grant us the vision to see the highest in one another, and grant us the opportunity to continue to be there for each other in good times, as well as not-so-great-times. and love one other in the same spirit. May sadness, disappointment and anger be minimal; may happiness, positive thoughts and good experiences together be bountiful. May we always cope, and hope, with each other... with Grace." Gratitude opens the way to forgive-ness - allowing our heart and mind to receive wisdom and experience release while letting go of timely attachments, expectations, or percieved notions on how life could-would-should be. Are there any grievances I have yet to resolve? Am I yet to forgive another person, or myself? As so, allow these memories to surface. With Gratitude, give thanks for their presence, lovingly asking, "What is the gift of this experience? What hidden wisdom is ready to be revealed?" As this gift is received and accepted by you, clear, seal and heal the experience by using this mantra: I AM For Giving LOVE with GRATITUDE. ... a (k)new perspective, as seen through the eyes of Gratitude! Emotions really are only indicators of the vibrational state you are choosing to express, and by awareness of the the variations in the inner comfort you feel, you will recognize their value. Your state of happiness at all times is determined by the choices you are making, and you can enjoy a lighter level of consciousness, either by choosing a brighter emotion, or by viewing yourself in a more positive light. Thus a sure method for invoking the highest emotion of joy, is to deliberately choose to either see yourself as the Divine being of Intelligent Love that you are, or to feel genuine gratitude for whatever the situation offers. The quality of your living is always a product of the choices you are continually making moment by moment. It follows then, that as you practice looking beyond appearances and express feelings of love, kindness and gratitude, you will enjoy immediate benefits of joy and well-being that are highly therapeutic, not only for yourself, but for our whole body. That kind of emotional attitude is a proven and enjoyable way of maintaining optimum heath patterns in both your mind and body. An excellent exercise to ensure your own inner peace, is to examine your consciousness for all embedded grievances, and dissolve them one by one with forgiveness.